Opulence is given a standing ovation in this antique-style piece from Apples of Gold. The lavish beauty of a garnet gemstone is featured as the main attraction in this ring. Rich and deep, the scarlet color of a garnet is always lovely to behold, especially in this 14K white gold setting. Six prongs make a safe display for the garnet, while the mounting holds a small, heart-shaped cutout below. On either side of the band rest dual patterns of engraved leaves to complete the antique look. 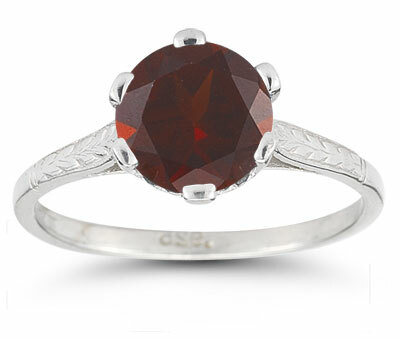 We guarantee our Vintage Leaf Garnet Ring in 14K White Gold to be high quality, authentic jewelry, as described above.